I assume it is not news to anyone that California in general and the Central Coast in particular has been experiencing an extreme drought. That means that most native plants that are adapted to this situation have been in waiting mode and are not doing much of anything. One ecological category of plant that seems to be able to grow under these extreme conditions is the weeds. The best definition I know is “a plant adapted to the disturbed conditions caused by humans or their livestock.” By the way, 7+ billion humans and their livestock currently make up 98% of mammalian biomass. This is up from 0.1% at the beginnings of Agriculture some 9,000 years ago. Human habitats include yards, vacant lots, crop fields, pastures. I suspect all of you have your own favorite definition of a weed. Bonnie came up with a new definition for a weed while she was working on the drawing for this issue of the Obispoensis. She noted that “a weed just says thank you when you put a sample in a cup of water and continues to grow as if nothing important has happened, whereas native plants tend to begin to wilt even before you can get them into water.” Weeds have a high tolerance for adverse physical condition, but most usually do not tolerate competition from other plants. Filaree belongs to the lowest classification given to weeds as it pretty much stays out of little-disturbed native vegetation. 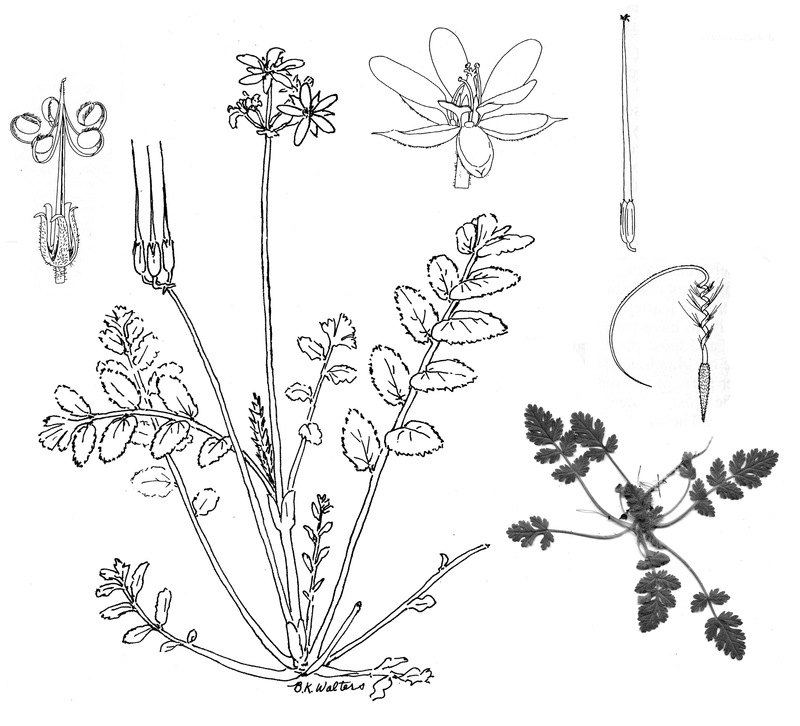 The two species of plant discussed this time are members of the genus Erodium. They are E. cicutarium (coastal heron’s bill, red stemmed filaree, red-stem filaree, red-stem stork’s bill) and E. moschatum (white-stem filaree). The illustration is a composite of Bonnie’s new and old drawings plus an additional digital scan. The large central drawing is of a whitestem filaree that was growing under crowded conditions. Note that most of its largish compound leaves, which are attached to the stem just above the root, are orientated nearly vertically. Contrast this with the scan of the red-stem filaree that was growing in a totally open habitat without nearby plants. It has its leaves lying almost flat on the ground. This is how all filaree species (including red-stem filaree) orientate their leaves when they grow in the open. The two filarees are found everywhere along the coast wherever humans or their livestock have modified the land. Prize winning gardeners will keep them at bay, but not ordinary people. These species are also found in disturbed ground in the interior, but there they are likely to share the ground with several other species of filaree. All these other species (E. texanum, E. macrophyllum, E. botrys, and E. obtusipicatum) have simple leaves. E. botrys is also to be expected along the coast. 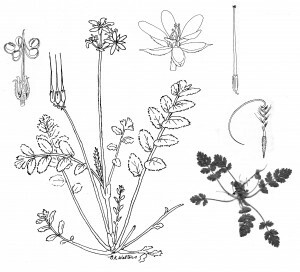 When Carl Linneaus first described the filarees, he put them in the genus Geranium. Later Geranium was split into three genera (Erodium, Geranium and Pelargonium) based on the number of male structures displaying fertile or pollen producing anthers. There are five in Erodium, seven in Pelargonium, and ten in Geranium. The rest of the flower, sepals, petals and female containing structure, gynoecium, differ only quantitatively among the three genera. There is a generalized flower and gynoecium included in the illustration. These are from an early edition of Dr. David Keil and my Vascular Plant Taxonomy text. Of particular interest is the gynoecium. Note the bulges at the bottom. These contain the actual seeds. Then there is the very long central portion (style) that resembles a bird’s beak. It is this structure that leads to the common names that have been applied to these plants, i.e., heron’s bill and stork’s bill. When the seed is mature, the gynoecium begins to dry out. As it dries, it splits vertically into five parts. Each part contains a basal seed-holding portion attached to its elongate portion of the style. When fully dry, the style portion begins to coil upward with increasing speed. By the time the coil and seed have reached the top of the style, it has enough momentum to be flung into the air and away from the parent plant. Most of them will land several inches beyond the reach of the parent plant. This is the sweet zone for seed dispersal. It is far enough from the parent to prevent competition but close enough to still have a similar environment. Dispersal over long distance is very risky because the probability of a seed landing in a favorable habitat approaches zero. Long distance dispersal among weeds is contrary to this thinking. We carry weed seeds with us and when the seed falls away from us, where is it likely to land? It will probably be in another human-dominated environment. Oh, by the way, after the seed-style complex lands on the soil, the style portion continues to expand and coil with changes in humidity. This allows for the seed to be pushed along the soil surface for a secondary dispersal. It also can serve as a “drill” to bury the seed in the soil. Our two common coastal filarees are not native Californians. Like most of us, their ancestors came from Eurasia. When they arrived is uncertain as they were already here when the first botanical surveys were done. When I first arrived in California I was easily persuaded that native California plants were great and the rest were terrible weeds. When I made the mistake of saying, “isn’t it a shame that there is so much filaree in this pasture,” in the presence of a rancher, the rancher quickly turned on me. He said in essence, “Thank God for filaree! It is what makes my operation profitable. Cattle (and guinea pigs) love it; it is one of the first plants to appear in the pasture in the spring and it continues to be present throughout the grazing season.” I haven’t been foolish enough to bad-mouth filaree since. Both species of filaree are not only good forage for cattle, but they also are good for human grazing as well; the web tells of people using the young spring leaves like parsley in salads and the roots in various medicinal ways. There is one last item about filaree. It can be so numerous in grazed pastures of the interior that they can produce what appears to be reddish-pink haze coating the ground. Look for it mid-morning when they are in full bloom. You might also try to imagine how many flowers it would take to create that haze. by Dirk Walters, illustrations by Bonnie Walters | Dirk and Bonnie Walters are long-time CNPS-SLO members, contributors, and board/committee participants. In addition to his work at Cal Poly, Dirk is the current CNPS-SLO Historian.